I recently found myself planning for a gala, and not having a clue what I should wear. Not wanting to invest hundreds of dollars in a dress I would likely only wear a few times, I checked out Renttherunway.com. I remember seeing this absolutely gorgeous dress on an actress on a TV show my kids watched. When I looked it up at the time, I found out it was a Marchesa Notte that retailed for $795. When I logged into Rent The Runway, I searched for Marchesa Notte and they had the dress I loved! It came in red, navy and teal. I opted for the red and started the rental process. Rent the Runway is brilliant for so many reasons. First off, they have hundreds of dresses you can rent, from $30 to several hundred, depending on the brand and style. This does not apply to me, but they even have maternity selections available! They will ask you for what size you think you are, and then ask for an additional size just in case the first one doesn’t fit. I am pretty consistently a size 4 or 6, so I selected both of those. Once I selected the Marchesa Notte, the site pulled up a calendar asking when my event was. 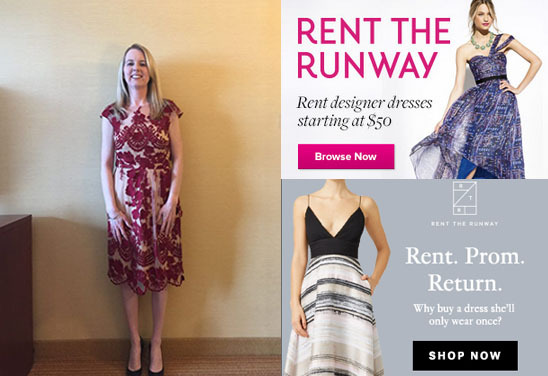 Rent the Runway will then tell you if the dress you chose is available for the time period – luckily for me, it was! I also got in on a promotional rate where they sent me another dress just in case I didn’t care for the first one after trying it on. Rent the Runway was running a promotion at the time of my rental, where I could make a second selection free of charge since this was my first time with the service. My second selection was an eggplant-colored ML Monique Lhuillier. At the time of rental I also had a deal through my American Express Plantinum card where I got additional points for renting. I went to check out, and my total came to $107.37, which included insurance on the dresses and $9.95 shipping via UPS. I opted to rent for 4 days, but there is also an 8 day option, which would be great if you were going on vacation. This also covers shipping back to Rent the Runway when you are finished. The website also features hundreds of reviews on individual dresses from people that have worn them, so you can get an idea of how the pieces really fit. This is really helpful, since high-fashion items tend to be sized differently than something you would buy at a department store. You even have the option to add on jewelry and handbags, as they have a specially-curated selection of accessories you can rent alongside your outfit. My selections arrived the Thursday before my Saturday gala. I was so excited the open the wardrobe bag and see the dresses in person! The fact that they arrived on Thursday was great, because if the selections do not fit you, Rent the Runway will overnight another size to you. I pulled the Marchesa Notte selections out of the bag, and right away found that the size 4 would not fit, so I tried the size 6 and it was perfect! 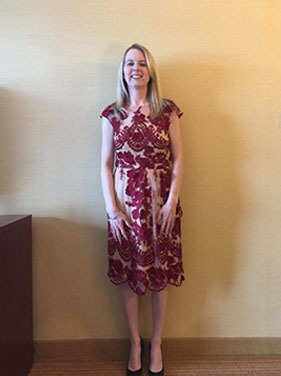 I pulled out the ML Monique Lhullier, which was a size 6 and tried it on too. It fit perfectly as well! In the end, I went with the Marchesa Notte dress, because I had admired it for so long. My husband and I did not know anyone else attending the gala, but all night I had people coming up to me telling me how beautiful my dress was! Rent the Runway sends you an email reminding you of when your selections are due to be dropped off at UPS. Reluctantly, I packed everything up and took it to the UPS store. When you receive your shipment, they include a UPS return label, so it could not have been easier. There is a $50 late fee if you don’t get it in by noon, so I made sure to get it there early. This was honestly a fabulous experience. I got to wear my dream dress, and I didn’t have to shell out several hundred dollars to do it. Rent the Runway has several other rental options as well. RTR Reserve, is the service I used, but they also have RTR Update, which gives you 4 pieces of clothing that you can wear all month before you need to return it. There is also RTR Unlimited, which will give you 4 pieces of clothing on constant rotation, that you can keep for as long as you want, while paying a monthly fee. If you use this service, you also have the opportunity to make purchases at a members-only discount. Just take a look .. you’ll be pleased. I will definitely be using Rent The Runway in the future. 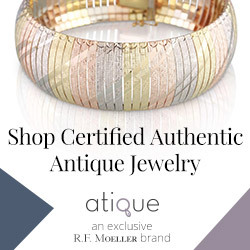 If you would like to try them, there are may promotions out there, including those the website offers, and you can use Ebates for an additional 1% cash back. 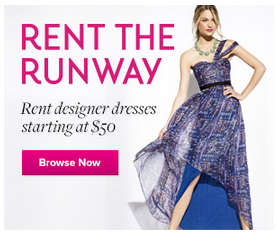 Also, check to see if any of your credit cards have special promotions for Rent the Runway. I will also be stalking the website on a regular basis to see if they put my beloved dress up for sale! Have you used Rent the Runway? Did you love it as much as I did?